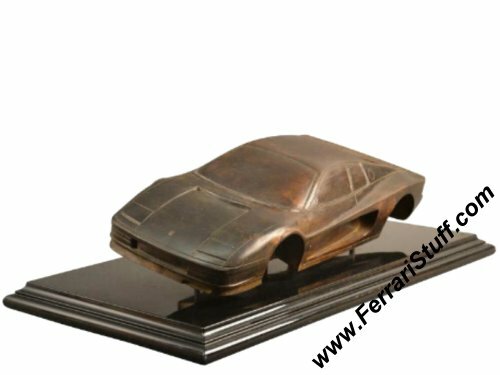 Artist proof of the Ferrari TestaRossa sculpture by Michel Sauze. 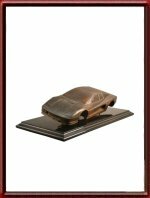 It is an artist's proof of the Ferrari TestaRossa sculpture with dark brown patina. Instead of an exact scale model, this is a much more artistic interpretation of the famous TestaRossa shape. It is believed to be one of the first to have been cast in this particular mold and was finished with a dark brown patina to give the artist a good impression of what the finished article would look like. Much, MUCH, rarer that the regular completely finished version. It measures a good 46 x 20 cm and is some 15 cm high. In Inches that is roughly some 18 x 8 and 6 inches high. There are more sculptures of Michael Sauze from this series available.